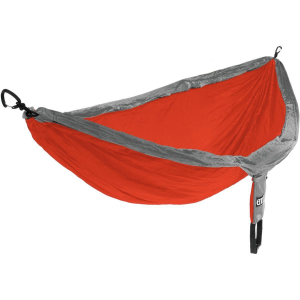 Tentsile's Flite tree tent is the company's lightest version of its hammock-tent hybrids. 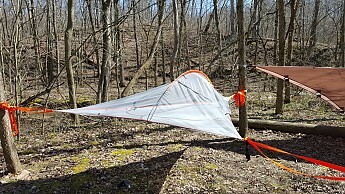 Combining the comfort of a hammock with the structure of a 2-person tent, the Flite is a novel idea that just does not execute very well. Although I like the concept of the Flite, the cons are significant enough that it would be hard for this reviewer to honestly recommend it to others. First let me say, I have written and read enough reviews to know that when someone dismisses a product many people will vehemently disagree with that sentiment. I have no problem with anyone disagreeing with me, and I truly hope that if you love this product that you will write your own review, telling readers why they should consider the Flite. I, like any other reviewer, can only write from my own opinion and experience. 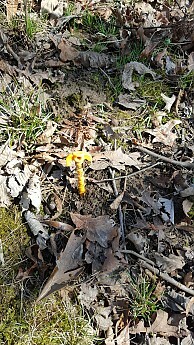 The Flite was tested on four separate occasions in March and April. Two tests were solo. One test was with my 13-year-old daughter. The last test was with my wife. Nighttime temperatures were in the upper-40s F to mid-50s. 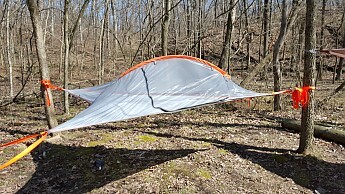 Out of the box, one can see the Flite is an extremely well-made shelter. Stitches are straight and tight. There are no loose threads. The straps and ratchet are heavy-duty. 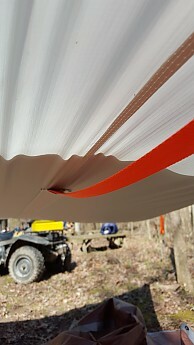 The screw-in tarp stakes are a clever design that I have never seen before. The same day the test unit arrived in the mail I was determined to sleep in it. So after work I set out to set it up. I really liked these screw-in stakes! My first test was a complete failure. Having set out to pitch the Flite, I could not find three trees spaced evenly enough to hang it from. A triad of trees near my house are spaced out 11' x 15' x 13'. I attempted to hang the Flite in various configurations from this triad, and finally had to give up for the night. 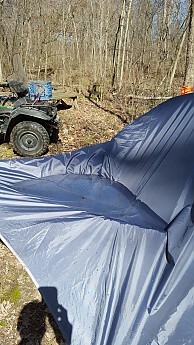 I shot an email to the person who had mailed me the tent for testing. 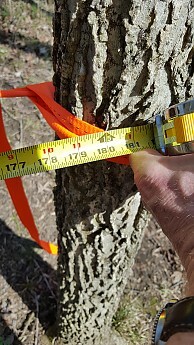 She told me I needed at least 12' between trees. On my next test, I found 14-15' feet was needed to get an optimal hang. 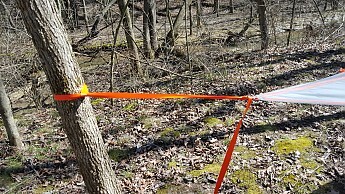 Scouting around the 200 acres of woods behind my house, there were relatively few spaces suited for hanging the Flite. I probably had an extra foot of space. The Flite's instructions state setup time takes about 10 minutes. Aside from the failed attempt of the first test, I found I needed 20-25 minutes on each setup. Of course, experience and practice should decrease this amount of time. To use the Flight, the user will need to learn a new knot called a “Cow Hitch.” The included instructions show a diagram of this knot, that did not make a lot of sense to me. Fortunately, I had enough of a signal for my phone that I could look up the Cow Hitch on the internet. but learn it before you take the Flite out! Removing the Cow Hitch after it is loaded is not an easy task. The user will probably need to use a multi-tool to take it out. 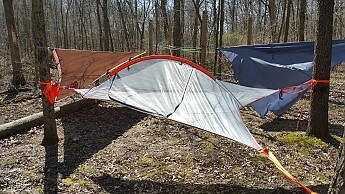 Once set up, the Flite is basically a floating tent. It's a clever design that uses tension to ensure a flat lay. 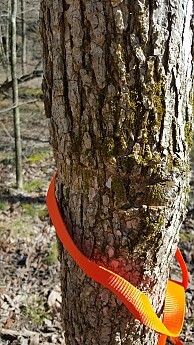 A pad is only required for insulation, not to keep that tree root out of your back. 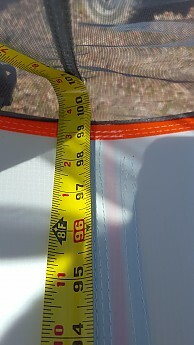 At its widest points, the Flite is 8' wide and 8' long. At the head end, the Flite is quite roomy. However, the foot end is another matter. With my shorter daughter, leg room was not a problem. With my wife, the night was spent battling for whose legs got to be on top of the other's. The picture below demonstrate how two full sleeping pads battle for supremacy in leg room. I had originally intended trying the Flite out with a hiking buddy of mine. However, after playing “footsies” with my wife, there was no way I was going to share this space with a full grown man. Uncomfortable foot end with legs overlapping. The tight foot space leads to another comfort issue. You always know when your partner moves—legs get shoved aside, and anytime one tent-mate rolls over, the other person is bounced awakened. My daughter slept like a log, and so I was fine. However, my wife and I had a different experience. At 4 a.m., my wife got up and went to sleep in a tent with our son. She told me in the morning that she had spent a very restless night worried about keeping me awake with her natural tossing and turning. Ironically, I did not sleep well for the same reason. In my rough drafts, other members of the Review Corps asked me about solo sleeping. 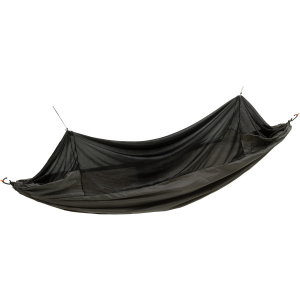 I found sleeping solo was more comfortable than a tent and less comfortable than a hammock. 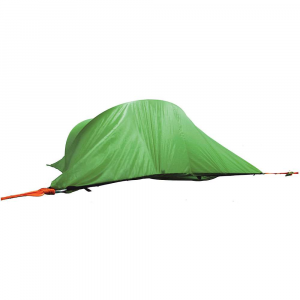 The tension strap that runs the length of the tent prevents you from sleeping in the middle of the tent. You must sleep on one side of center or the other. 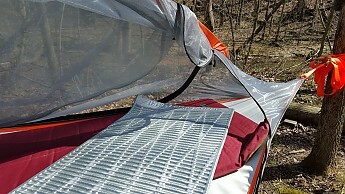 Of course, that ensures there is some sag on the side you sleep, but this was not so bad that gear was sliding around. My heaviest gear was stored under the Flite. 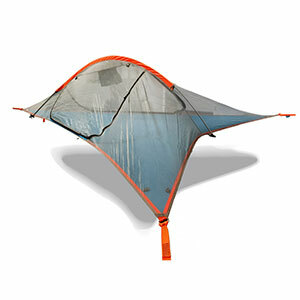 From the first setup, I felt like the rain fly was more of an afterthought than a integral part of the shelter. 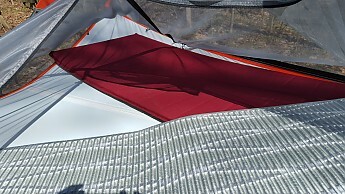 The bug netting and fly are held up by only one tent pole running along the top of the Flite. 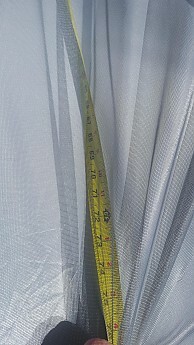 The bungee cords were non-adjustable, and pulling them too tight caused the tent pole to sag. 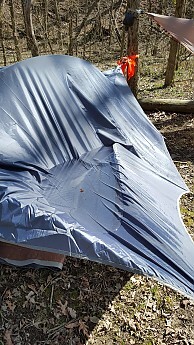 I never tested the shelter in high winds, but I did test it during a night of moderate rain. Sleeping solo on the left side of the Flite, I awoke to find the right side collapsed and full of water. After a night of moderate rain. To be fair, the fly did keep the rain out. Nothing in the Flite was wet, but this was certainly a major failure in terms of being a weatherized shelter. The Flite is marketed as 4-season, but it certainly wouldn't stand up to a heavy snow. I am left to wonder if I had slept on the right side, if the collapse would have still been on this side or have shifted to the other side. 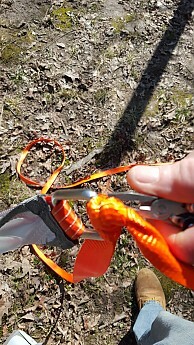 As a conscientious hammock hanger, I am mindful of using wide straps to protect trees from damage. 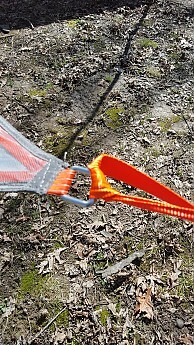 The Flite's straps are as wide as anything I have used with a hammock. So I was very disappointed after my first “successful” night when I put the Flite away. 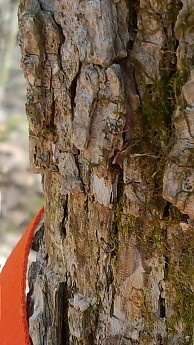 Very noticeable damage was noted on a tree that I have often hung hammocks on. 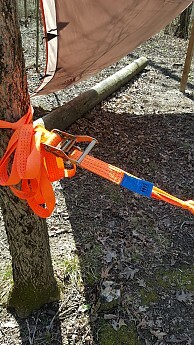 To me, it was unacceptable that the Flite's directions did not specifically mention the need to add pads between the straps and tree. This simple step would have made all the difference. Originally, I had planned to test the Flite several more times, but my wife and daughter both refuse to give it another shot. Neither of my sons are interested in it after hearing the feedback. As I said, I became reluctant to try this with a hiking buddy because of the foot issues. And, honestly, I have no desire to sleep in it again myself. I think this is great feedback for the engineers. I bet the 2.0 will be much better because of it. Thanks. Thanks for the helpful review, Goose. 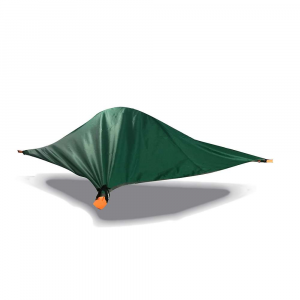 Tentsile says "All our tree tents are made to be suspended over the ground, but in dry conditions can also be pitched on the ground like a conventional tent." Did you have the chance to set it up on the ground? No, I did not test it on the ground. Interesting product and good review, Goose. 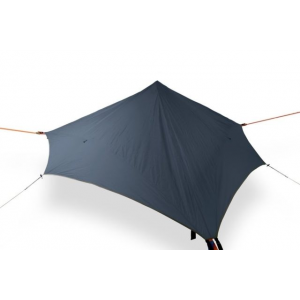 The Tentsile Flite Tree Tent is not available from the stores we monitor. 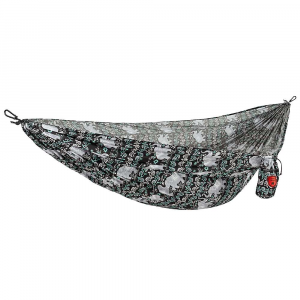 It was last seen June 23, 2018	at REI.